Cinema actor Gordon Standing, of noble acting stock, had played Horatio in the “Modern Hamlet” on the East Coast stage. Back East he’d starred in Lasky, Vitagraph, Inspiration and D.W. Griffith film productions. But then he got it into his head to come Out West. Though he’d been wounded several times in the Marine Corps during the Big Scrap, nothing could have prepared him for the horrors of Hollywood. 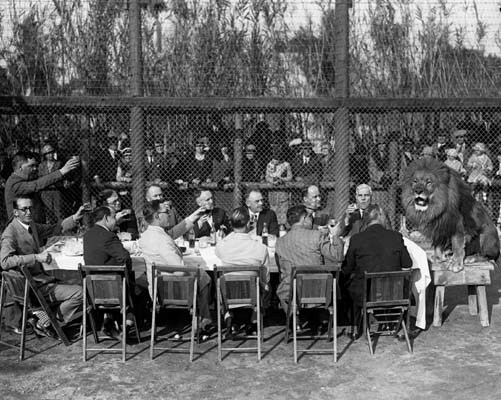 The Selig Studio had a "jungle area" in which to film, but their lions weren’t of the perfoming type; the question stands, then, was the rent-a-lion that killed Standing none other than famous snarling L. B. Mayer sidekick Slats, denizen of Gay’s Lion Farm (where lions would run amok a mere sixteen months later)?